There’s something great and vast about Life that eludes me. Often we try to pierce the veil of this reality with feelings and emotions that are thrust out of our soul like spears into the night in an attempt to touch that ethereal something that barely escapes the fingertips of our soul. We call it searching for Truth, but the concept is always so nebulous. We try to use words to wrap something tangible around those feelings and paint them into something that we can grasp, but there are some things that can never be roped into anything rock solid. There’s more to Life than we can ever understand. We think we know, but it is all beyond our comprehension, and much bigger than we can imagine. We all have a concept of what God is, how big He is, and where He resides, but it is only translucent glimmers in our soul. Somewhere, way up there, is God. We feel that if we could just slice into the fabric of Reality with a knife, we would see Him sitting on His throne surrounded by all those angels, but we don’t have anything sharp enough. So we try to bring it all into focus with words, vaguely aware of the impotency of our efforts. Still we try, because somewhere down deep inside us is an urgency that knows that Eternity is waiting for us at the end of our lives. Somewhere on the other side of that dark door of death our ultimate destiny awaits us, silently, patiently, and immovable. We can feel it, but we can’t quite put our finger on it. We try to grasp it, but our fingers come back empty. Wasn’t it Thoreau who said, “Most men lead lives of quiet desperation”? Life in this reality is absorbing, but transient. Our time seems to be spent in a sea of long pauses that are filled up with work or amusement, while we wait for those intermittent islands of something truly meaningful. Not that love, charity, fun or any of the other things of life that we value are vain, but every once in a while, we are able to reach through that veil and we touch something eternal. Sometimes, it is just for a moment, but it is enough to realize that we had a fleeting grasp on something that transcends this world. A friend of mine said that there’s more to God than what we want. Just as God is greater than what we can want, so life is much more than what we see with our eyes. I want to finish the course of my life knowing that I have at least touched some islands of true reality, and not gone through a lifetime numb to my eternal destiny. If God is true, then being able to touch the Throne of God is the only real thing that we can do. To dismiss that as a secondary interest is to miss the meaning of Life. We pass through the road of Life only once, and then the door of Death slams shut. Reach through the veil and go through life with your fingers grasped around the hand of God. Sheer rebellion. 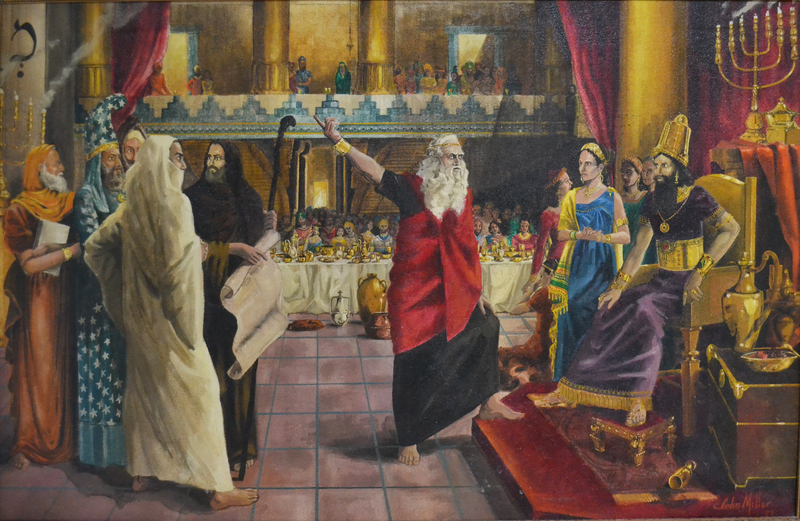 We look back now and can clearly see Belshazzar’s utter foolishness in defying God, but at the time, he was the guy in power and he sure seemed to be bullet-proof. After all, the mightiest army on Earth had just left and given up the siege around Babylon. Where were those rumors now that there would only be three generations to Nebuchadnezzar’s reign in Babylon? Cyrus was gone. The great Babylon was impregnable! They were stronger than God! Daniel was an old man by now. Under Belshazzar’s grandfather, Nebuchadnezzar, Daniel had been a man of great authority in charge of the affairs of state for this great empire. He was a man much sought after for his wisdom and his eerie ability to understand mysteries and dreams. He had a personal connection with God that even the king respected. But not Belshazzar. Character and integrity are not always passed on to subsequent generations, and Nebuchadnezzar’s grandson, although aware of his grandfather’s humbling experience with God, refused to submit to God. He heard Daniel’s warning from the Hebrew prophet that he would be the last of Nebuchadnezzar’s line, but he laughed at it. And now Cyrus, Babylon’s greatest threat, had been defeated and just to show his arrogance and defiance, Belshazzar would bring out the sacred vessels and have a drunken party for a thousand of his lords. Daniel, who had been set out to pasture, was in his 80’s by now. He knew the time was nigh for the fulfillment of the restoration of Jerusalem that would come after 70 years of captivity. He had served well during those 70 years, but how long it had been! But there would be one more mission for God, his greatest one. He knew the prophesy in Isaiah 44 and 45 well. Whether he understood the details or not was not important. That which God had promised, He would bring to pass. And somehow this revelation had been handed to Daniel to be brought forth at the right time. And now the queen was calling for him to come into the banquet room to tell the king what the writing on the wall meant. God does not move according to our time schedule. I guess you already knew that. There is a three-part process that sometimes takes so long, you wonder if it will truly ever come to pass. But God says that he that comes to God has to first believe that He is and that He is a rewarder of them that diligently seek Him (Hebrews 11:6). The prayer, the promise, and the fulfillment — You pray until you get an answer, and then you wait for it to happen – and it always takes longer than you expected. How long did Daniel wait? When was the prophesy first revealed to him? Did he know that he could not die until he met Cyrus? Did he stand inside the banquet room to point at the handwriting on the wall and then show this new king the ancient prophesy that was 400 years old with Cyrus’ name clearly written along with a full description of exactly how he would conquer Babylon? Did Cyrus the new king turn slowly to look at that handwriting and feel a cold chill come across him that it was God, not Cyrus, that had conquered this city? They say that God moves in mysterious ways. I suppose that’s true. I, for one, have quit trying to figure out what He is doing. I often joke that I subscribe to the Alfred E. Newman philosophy from Mad Magazine, “What, me worry?” It’s a whole lot simpler to just let God be God. He does a pretty good job of it when He is free to do things His way. Just let me get out of the way. Sometimes we put a time limit on God. We toss our prayers out there, click our heels three times and expect to be back in Kansas. And when the answers to those prayers fail to materialize, is that a failure of God’s timing, or a failure of us to pray until we get a real answer? Do you pop out 60-second snapshot prayers and expect God to jump to your rescue, or do you contend before God, grab hold of the horns of the altar, and continue to cry out to God until you feel that anointing come down with that sweet knowledge that you know that you know that your prayer is answered? That kind of victory in prayer gives you a grip on an answer that is sure for Eternity. Without that, all you have is a case of wishful thinking … and that is presumption, not faith. Daniel was a man of prayer – three times a day – and yet he ruled the largest kingdom on Earth at that time. He made time to pray, and he sought the face of God until He answered him. That’s why when Daniel prayed, God listened. If ever there was a man to choose for this incredibly important mission that would take 70 years to fulfill, it was Daniel. Sometime I wonder if very many people really understand prayer. It seems that it is becoming more of a function like brushing your teeth than a source of life, and like brushing your teeth, it has become something we do (or as least say we do) because we are supposed to, rather than it being a desperate necessity of life itself. We have lost the art of prayer, and in so doing, have lost touch with God. Instead of entering into that deep chamber of personal prayer in the presence of the Most Holy, we have learned to pray at God, supposing that if we lay out our request list on the table, maybe He will read it. I listen to church members as they take turns praying, each making his or her little speech, going down the checklist of the items that need to be addressed. I suppose we figure that if we pop the words out there, somehow they will make their way up through the airways and clouds and grab His attention. Or maybe someone up there gathers them all up and brings them to Him. Maybe He will listen; maybe He won’t. After all, there’s a lot of stuff going on up there and He must be pretty busy. Or maybe it’s just a simple numbers game. We get on Facebook and round up as many Likes as we can. Maybe if we can get enough people praying, surely He will pay attention. So we tell everyone to pray, and of course everyone says they will – and some really do – but you wonder at what level of intensity do they take that request to the Throne of God. Are we talking about “contending prayer” or a 60-second snapshot? I don’t want to sound critical or ugly here, but I am not seeing what the old-timers used to call “storming the Throne of God”, crashing the gates of Heaven, or shaking the Throne of God until He answers. They used to call it “praying it through”. Does anyone do that anymore? Or are we simply satisfied with crumbs? Do we merely hope that somehow maybe, just maybe, God will answer our prayers, but we don’t have what it takes to make sure? Later in Psalm 91, David says that all these promises are realized because you have made God “your habitation”. This is not tossing up some grocery lists of prayer requests in His general direction, hoping that something will stick, or assume that if we speak the word, God will answer because of some vague scripture you read says so. That is not faith; that is presumption. No, what David is describing is a deep personal relationship with God that pierces the veil and puts you right into the presence of God. You are there. You are not only standing right in His presence, but have entered into that “secret place of the Most High”. It’s you and Him. Together. You can feel His presence. There is a hush of holiness that fills the room. He has become your habitation and you abide in Him and He in you. This is beyond faith. You have stepped into the reality of Eternity. Now you can ask what you will and He will answer you. There is no question, no wondering. You don’t have to quote a scripture to bolster your faith – you were there, standing right before Him in that secret place! You have gotten the victory and it is done! I have said that revivals have to be prayed in. There is no other way because it is prayer that moves God. The same applies to our personal lives and the life of our churches. Many churches these days have no prayer room, and their prayer meetings attract only 1% of the congregation. And when they do gather to pray, it never reflects the same intensity that I have described here. They are not desperate for God, and when you listen to them pray, you can hear the absence of it. They just don’t get it. They acknowledge it; they hear, but they don’t hearken. I am sure many of you will quickly jump to a defense of other methods of prayer. Yes, God can hear the faintest cry of the heart. Yes, He knows every word that you speak. Yes, everybody is different in their approach to God. Yes, yes, yes. I have heard it all. But I would ask you, if faint-hearted prayers and anemic prayer meetings are so valid, then where are the results? As Gideon said, “Where are the miracles that our fathers told us about?” Where are the outpourings of the Holy Ghost that crash out of the sky and lay you flat? Where are the altars packed with souls coming to salvation? Where are the manifestations of power in casting out demons? Where are the healings? Not the hope that God will slowly ooze healing into them or guide the surgeon’s hands, but the supernatural, right now, in your face, power of God, instantaneous power of healing? Where are the prayer hours that are so supernatural that you get lost in them? Do you believe God or not? If these signs will follow them that believe, where are they? Maybe we have not learned how desperate we are. Maybe we have traded that secret place of the Most High for a place of convenience. Maybe we have not seen an example of what a really prayer warrior prays like, and we have lost the art of prayer. Maybe we care; maybe we don’t.